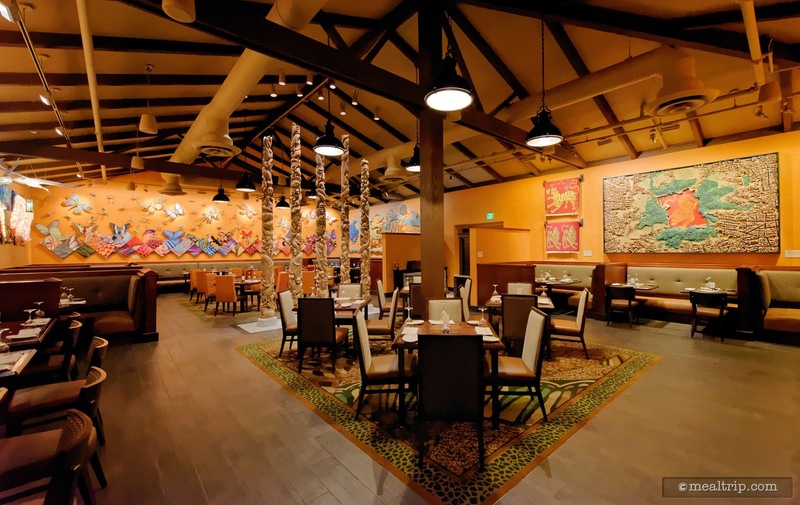 The Tiffins listing is a Signature - Fine Dining dining location at Animal Kingdom featuring World Cuisine cuisine. There are 55 photos in the Mealtrip photo gallery for this location and dining period. 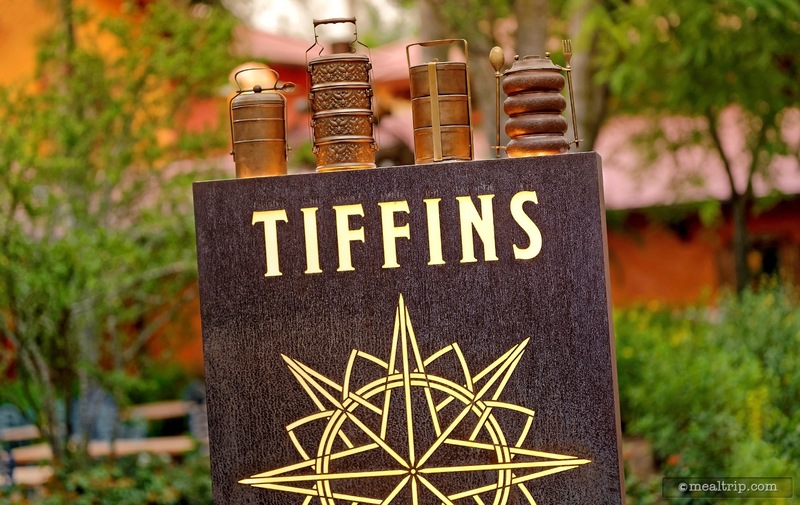 The Tiffins listing currently has a score of 87 out of 100. 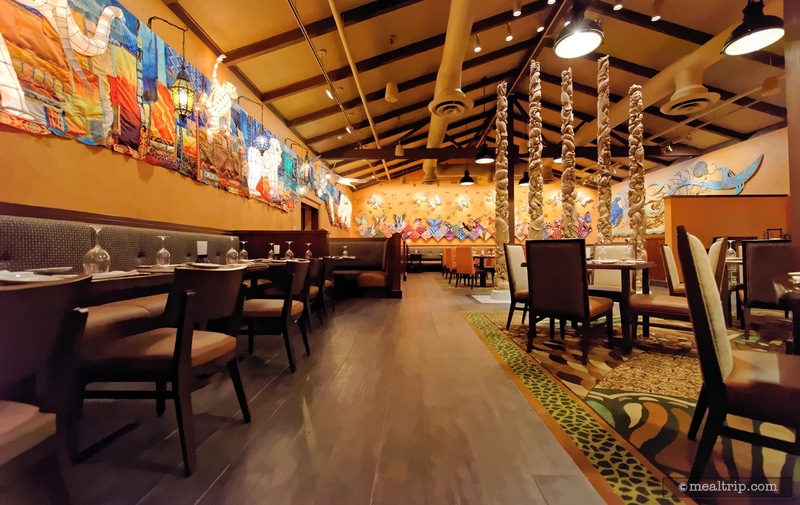 Click here to read all of the reviews for this location, or log in to Mealtrip.com to add your own review for Tiffins. 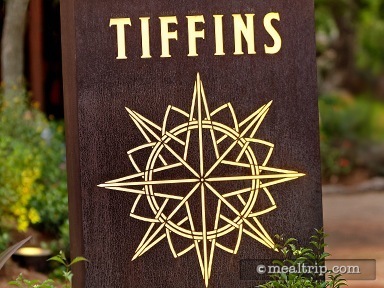 The exterior sign at Tiffins in Animal Kingdom. 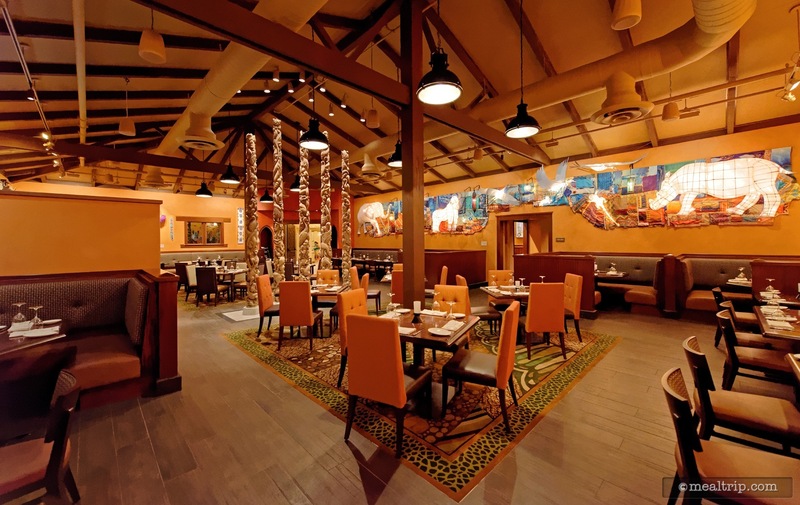 The main entrance to Tiffins is on the right while the main entrance to the Nomad Lounge is on the far left. 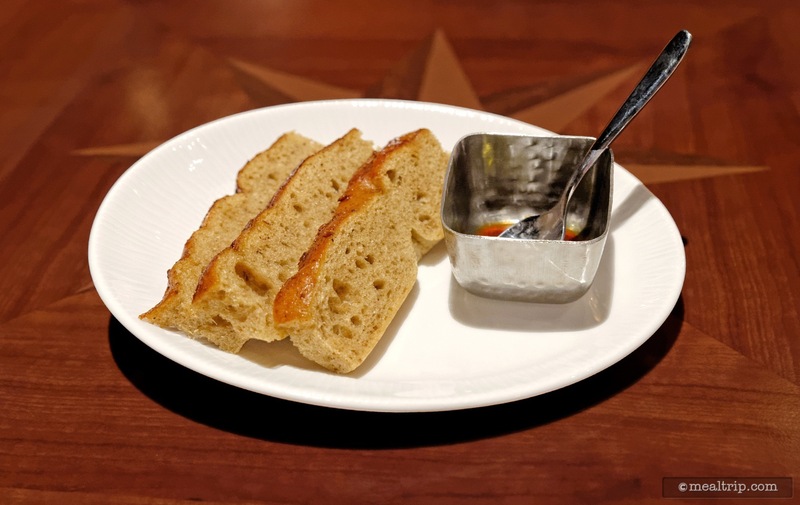 This is the complimentary bread service at Tiffins. The dense, moist focaccia bread has a very unique flavor profile that could become addictive. 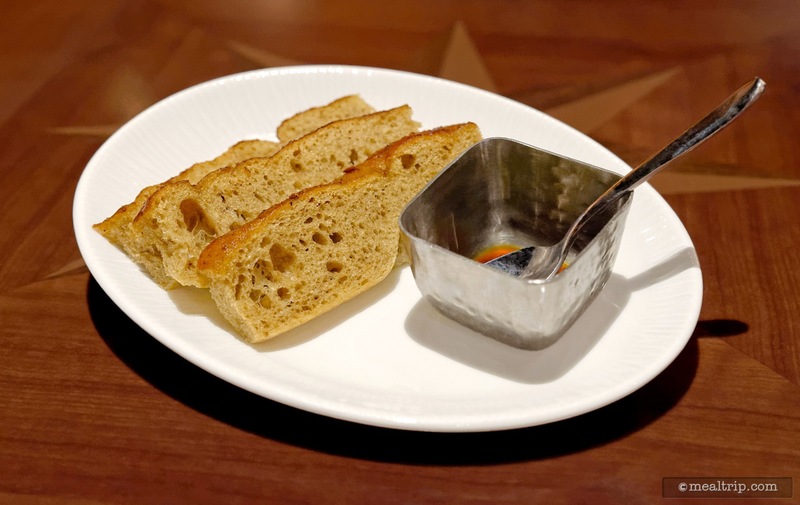 There is a "pomegranate, molasses and olive oil" combination in a side cup that your can lace onto the dense focaccia bread with a cute little spoon. You won't need much of the olive oil to pick up the unique flavors. 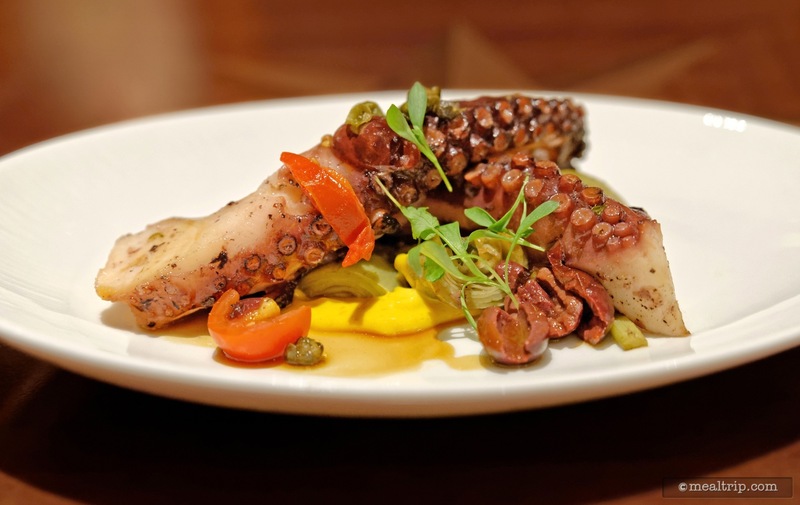 The Marinated Grilled Octopus as served with grilled artichokes, tomatoes, halved olives and a Mediterranean Aïoli. 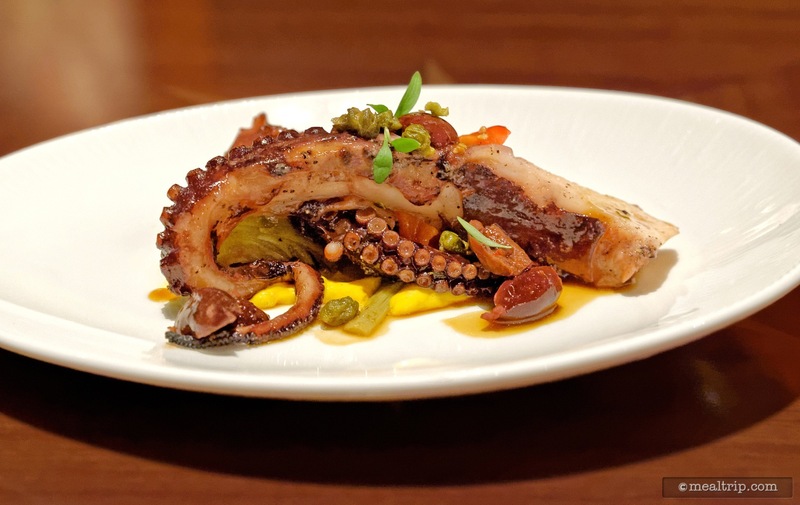 The Marinated Grilled Octopus is served with accompaniments that will change seasonally. The Hoisin-glazed White Fish of the Day looks all tidy when served and all of that gorgeous black Forbidden Rice is well hidden. 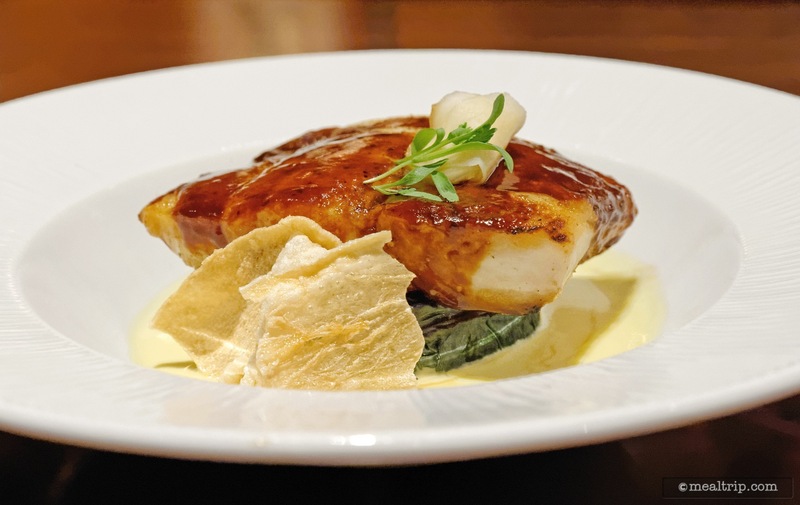 We've seen the Hoisin-glazed White Fish of the Day with Halibut and Grouper (so far). The ivory colored sauce at the bottom of the bowl/plate is the Turmeric, acting somewhat like a Beurre Blanc sauce (without the wine). 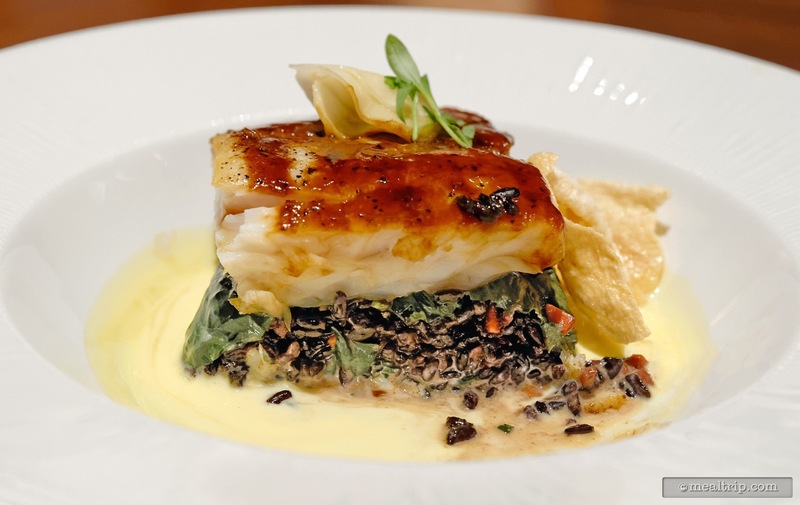 Cutting into the Swiss Chard medallion under the fish reveals all of that Forbidden Rice. 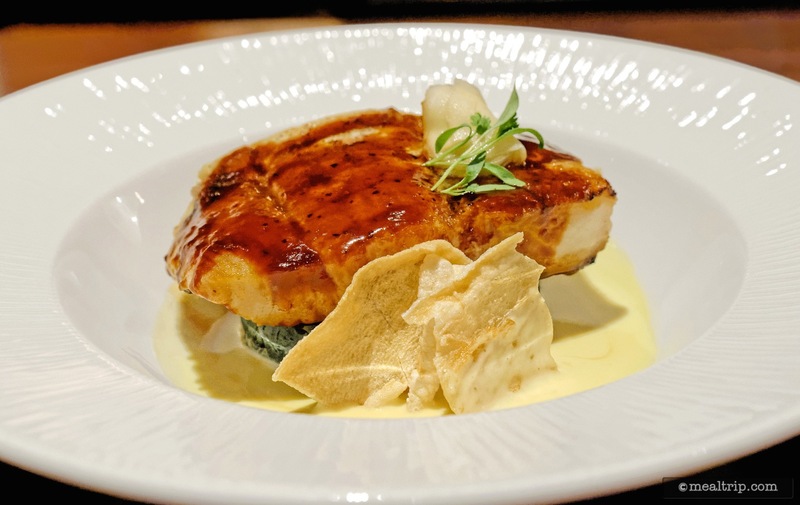 It's a really neat way to plate this stunning dish. 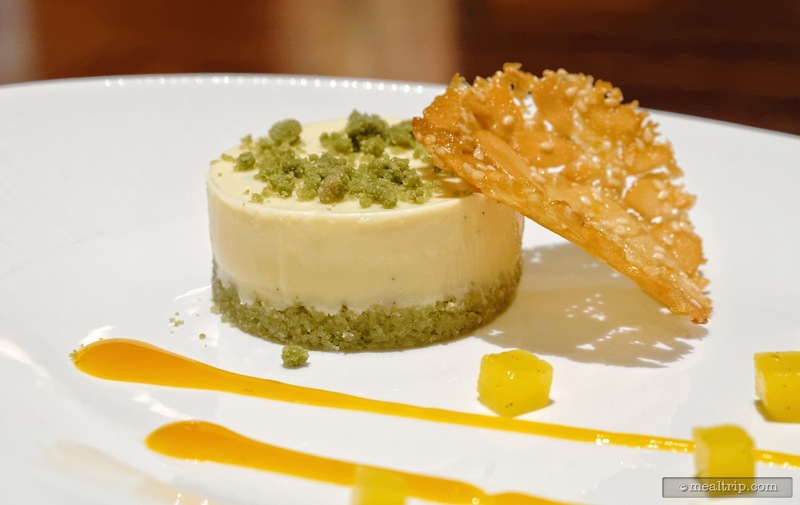 The very light Lime Cheesecake with Almond-Sesame Tuile and Green Tea Sponge from Tiffins. That Almond-Sesame Tuile is quite good... it's not just there as a garnish! 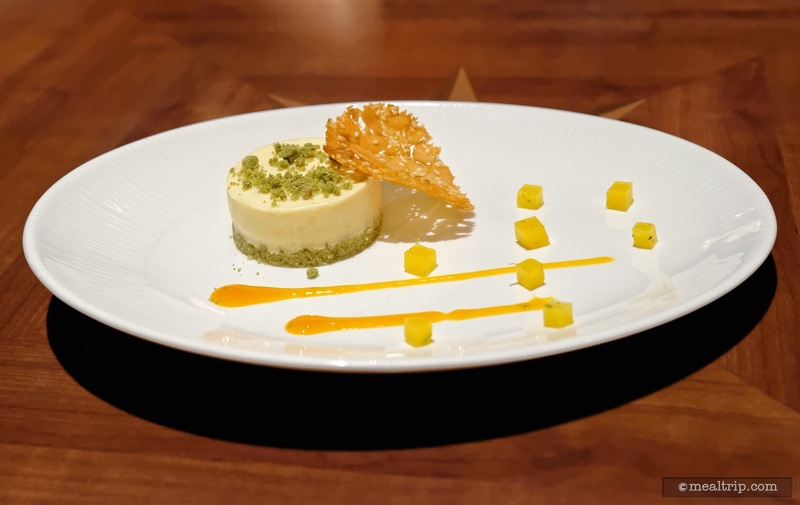 Small perfectly cut mango cubes dot the plate on the light Lime Cheesecake dessert at Tiffins. 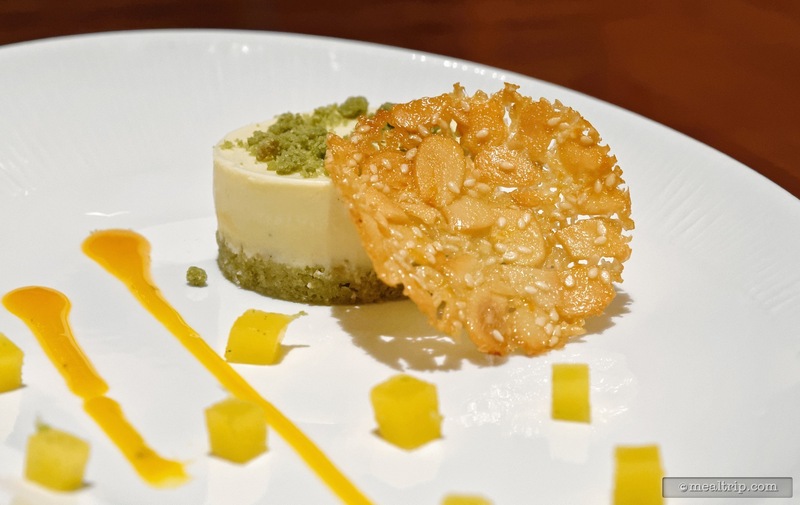 All of the flavors in the Lime Cheesecake are subtle and complimentary. 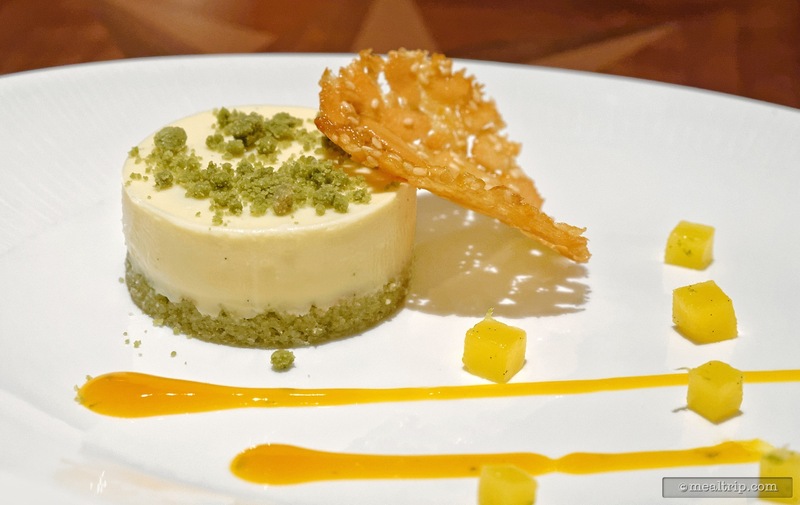 The "lime" is not an overpowering presences in this dessert. 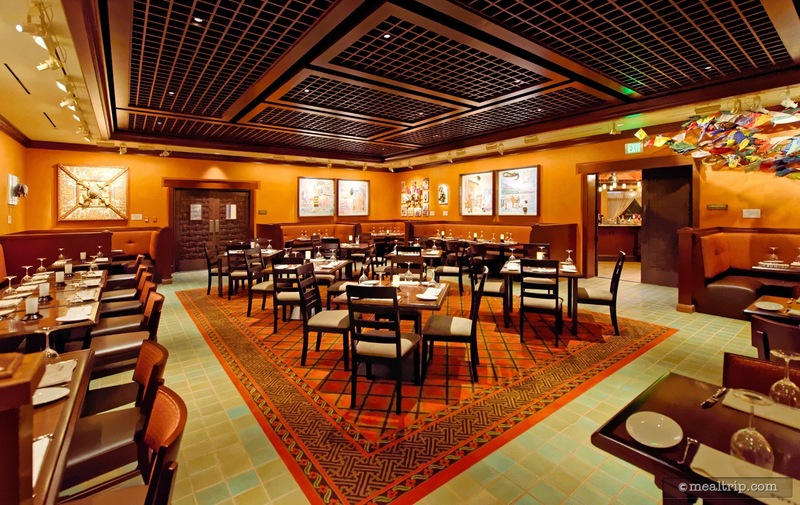 The sparsely decorated lobby/entrance at Tiffins, is actually even less narrow than what this photo suggests. 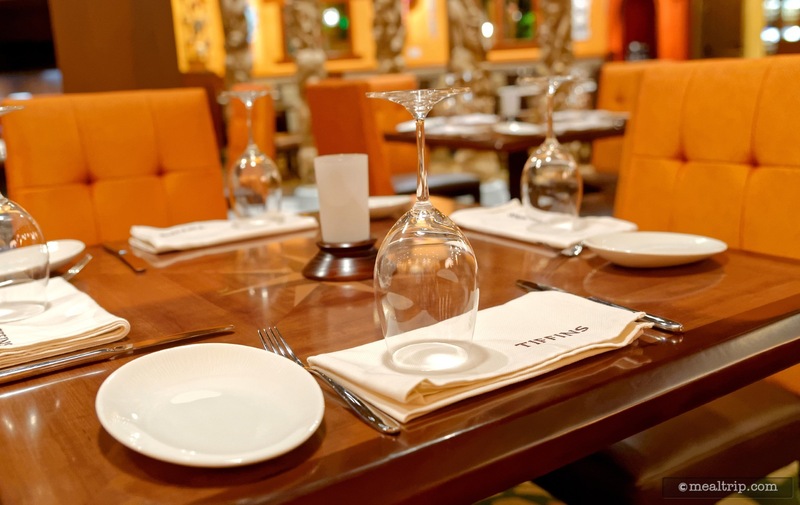 There's barely enough room for 10 guests in the lobby area, which is why you are asked to provide a cell or text number... you can then stand outside, and the host or hostess will text or call you, when your table is ready. 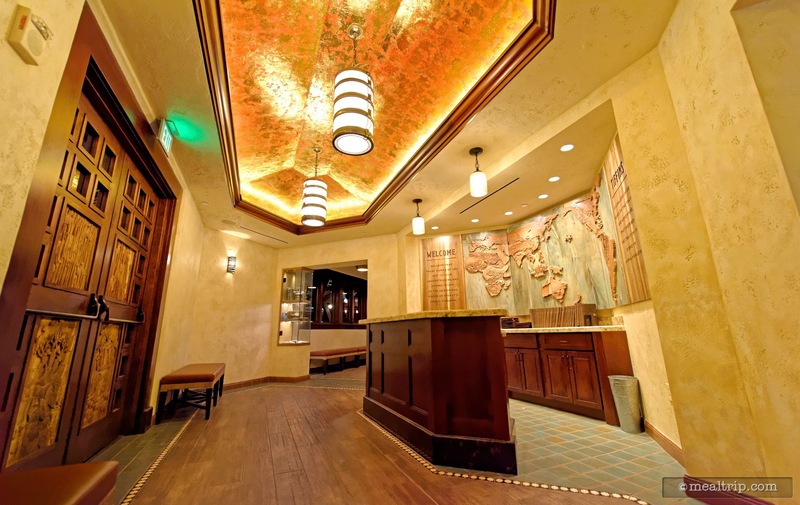 The faux-copper treatment for the ceiling is quite nice in the lobby area at Tiffins, as is the wood carvings that are part of the door inlay. The area is, rather tight though. 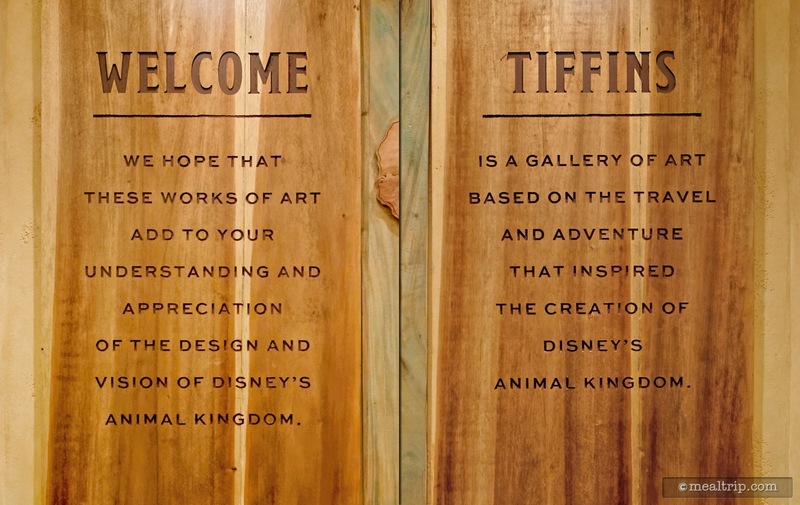 These wood panels are located on either side of the main lobby desk at Tiffins. 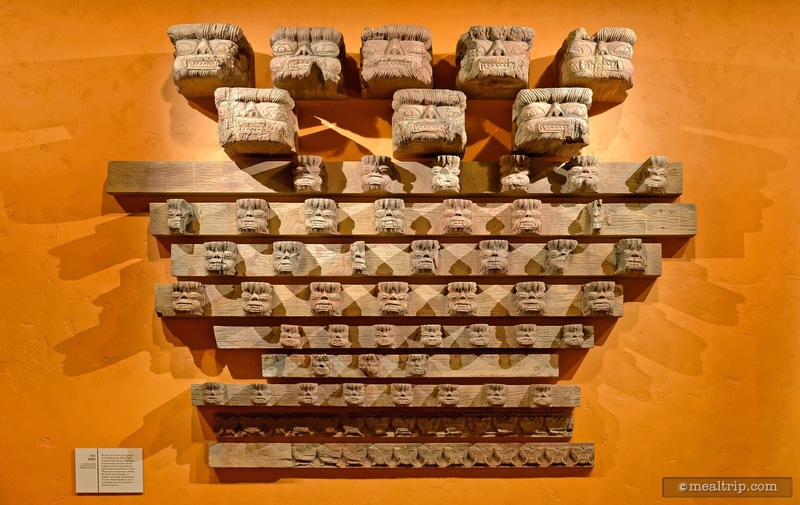 The term "gallery of art" is used loosely. 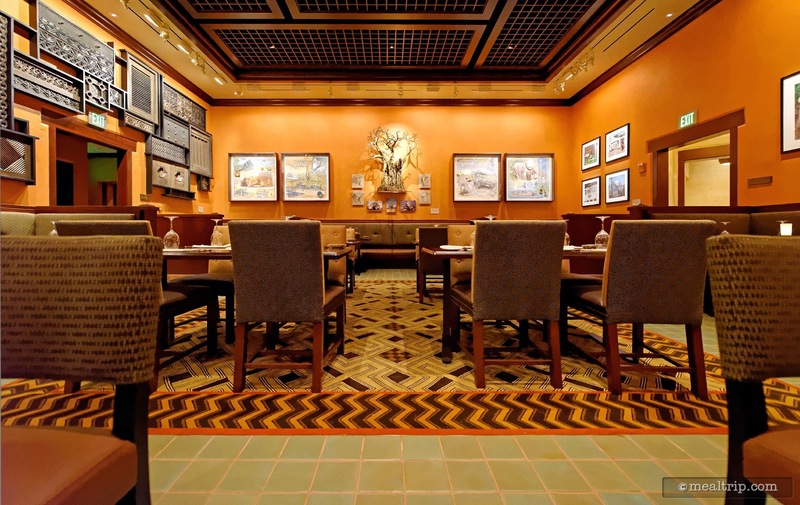 This is a great place to eat, and not a museum so much. 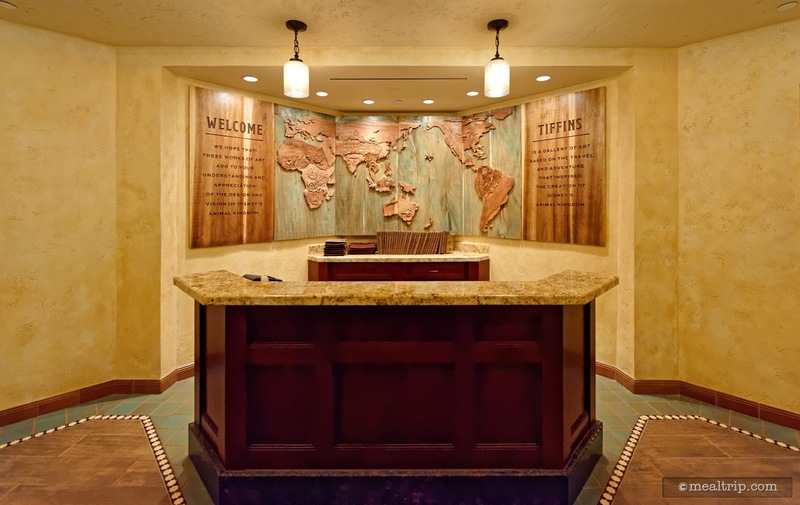 Here's a closer look at a wood-carved map of the world that is located behind the Tiffins check-in desk. 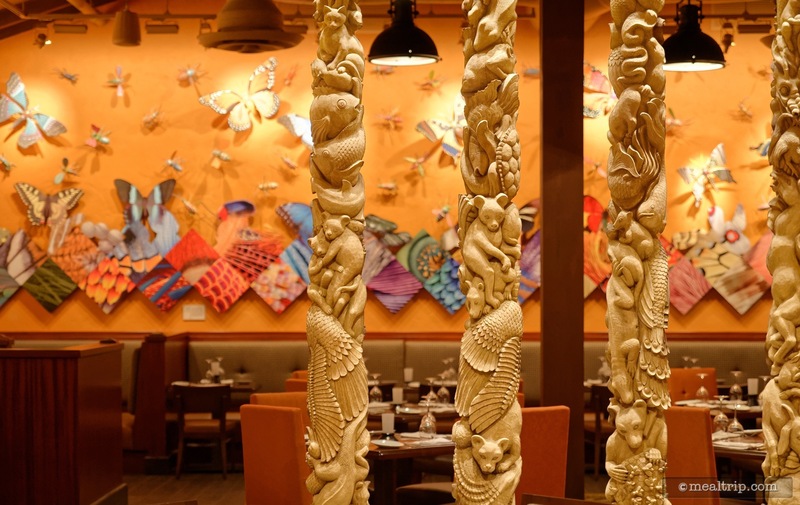 It really is a remarkable piece... one of the more detailed "original" artworks at Tiffins. 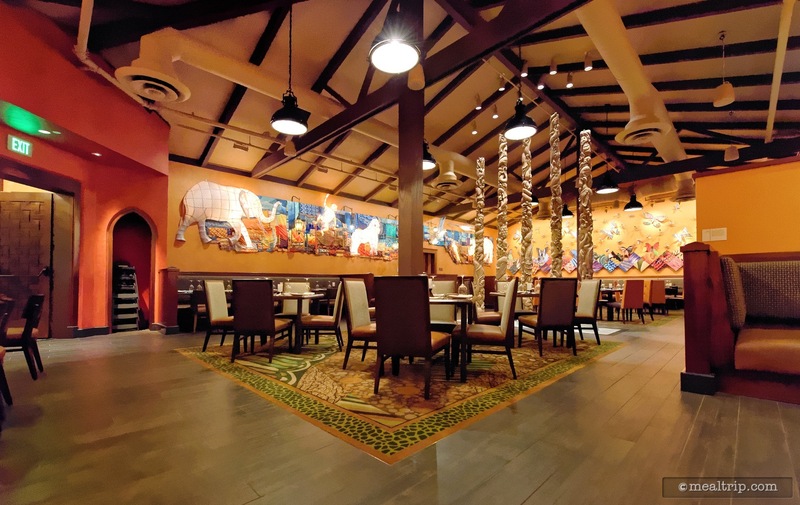 This dining area at Tiffins has been named the "Trek Gallery", and is said to contain inspirational artworks for the Anandapur section of Animal Kingdom. The core seating areas in the Trek Gallery room are spaced out nicely, so you don't feel like you are crammed right up next to another party. You will, however, feel a bit crammed up to the party next to you if you're sitting on the giant communal half-booth thing. I don't often add editorial to photo captions, but I don't think this type of seating has any business being in a restaurant where the expected per-guest tab is $75-$100. This is probably the shot of the Trek Gallery that supports the idea that the location isn't well-appointed enough to justify high "design or environment" marks. It's just somewhat nondescript and sparse. 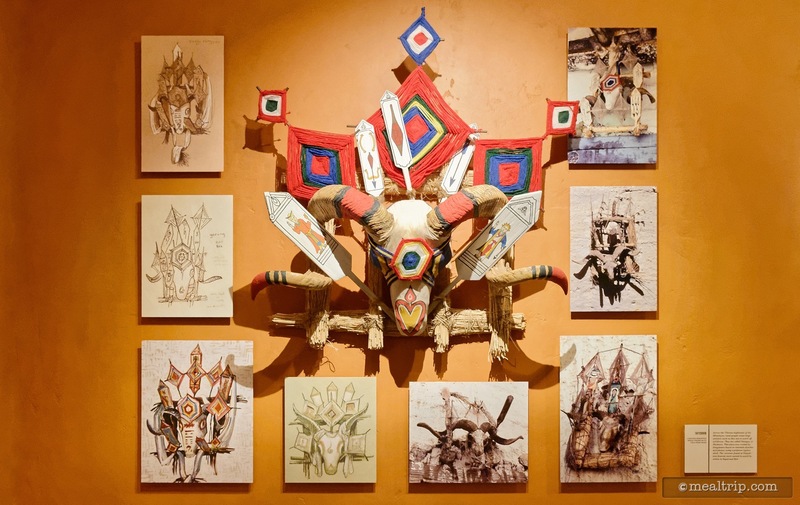 A "Yeti Heads" wall art piece at Tiffins hangs in the Trek Gallery Dining Room. 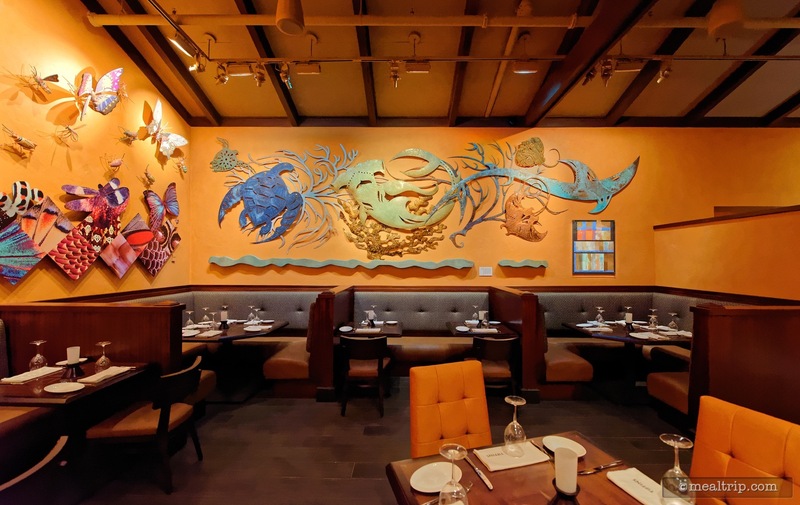 An art piece called "Skydoor" in the Trek Room at Tiffins. 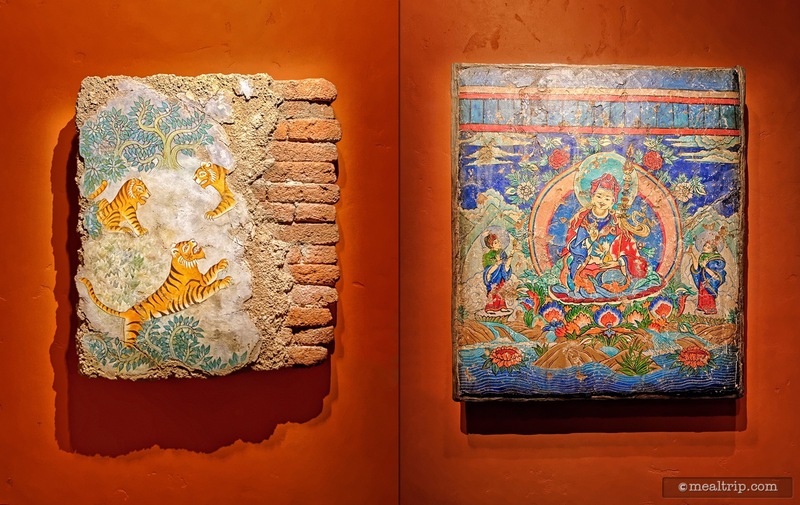 In a museum or gallery-like fashion, you'll see a small box (to the bottom right for this piece) with the title and a description for each of the wall art elements at Tiffins. There are some cool artwork-type elements hanging on the walls (of all the dining areas, not just in the Trek Gallery), complete with little museum-like description tags. 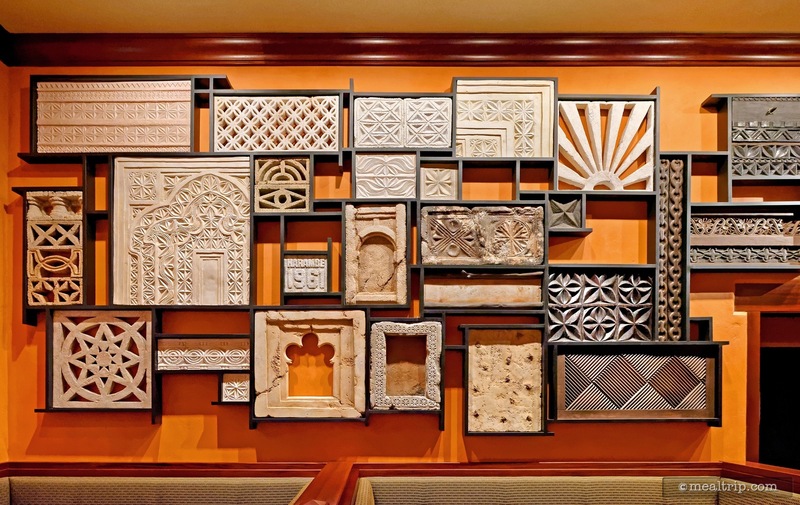 However, most everything is a reproduction or made just for hanging on the walls at Tiffins. 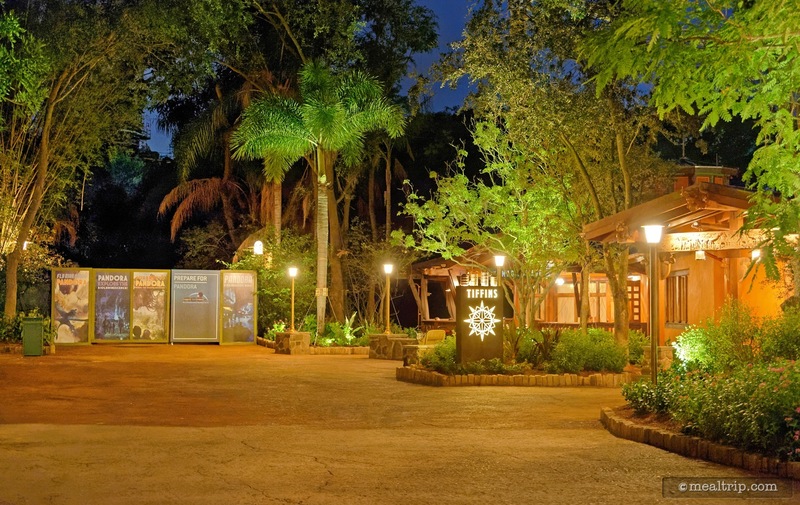 This is the "Safari Gallery" at Tiffins, and is said to contain art elements that led to the design of Animal Kingdom's "Harambe" area. 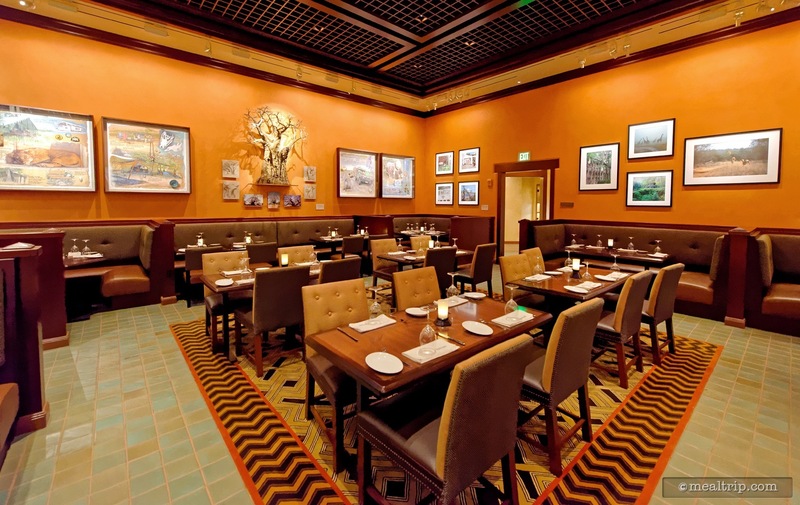 The Safari Gallery "feels" like the smallest of the three dining areas at Tiffins (I have no actual measurements to back up my instincts). 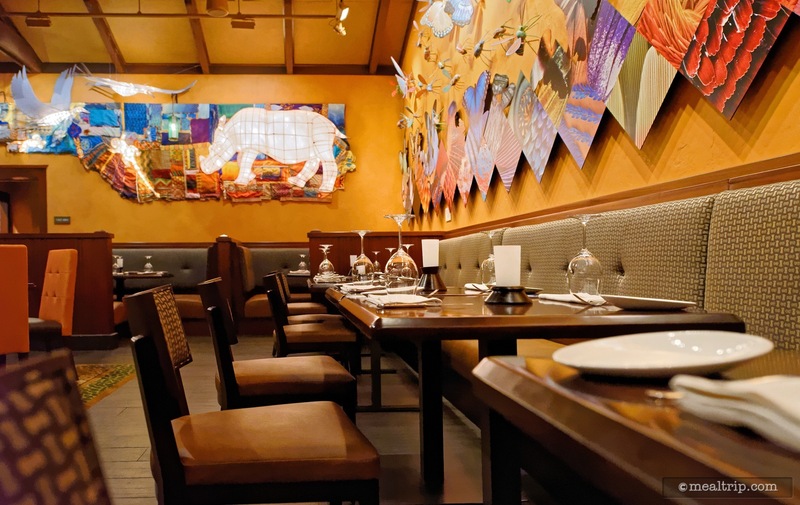 The table setting in the Safari Gallery at Tiffins. 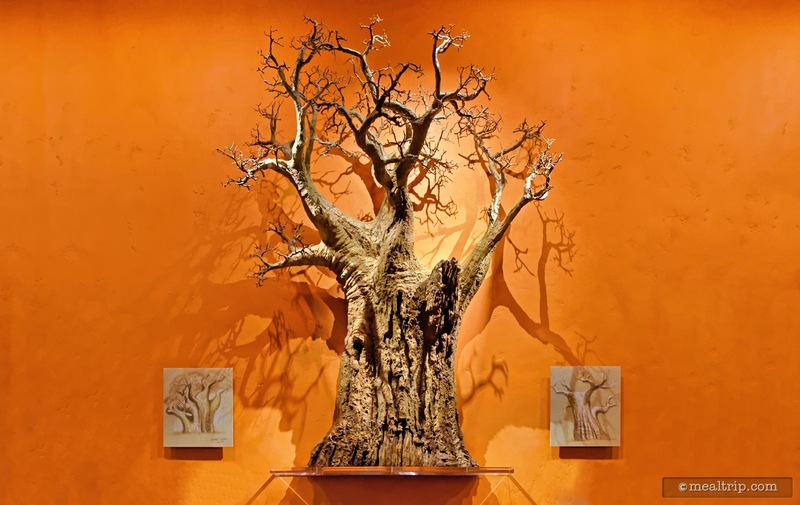 Oh no, it's the creepy tree that ate Robbie in the original "Poltergeist" (1982). No, no... I'm sure that's not the "actual" tree. One-One Thousand, Two-One Thousand, Three-One Thousand, Four... Agh!!!! Hummmmm... well, at least it's properly sized to fit in the space between the booth backs and the top of the wall. 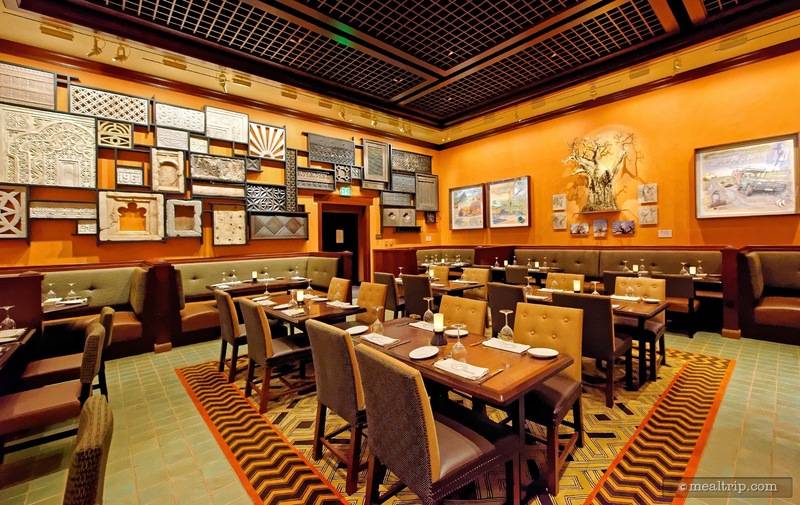 Looking north across the Safari Gallery Room at Tiffins. 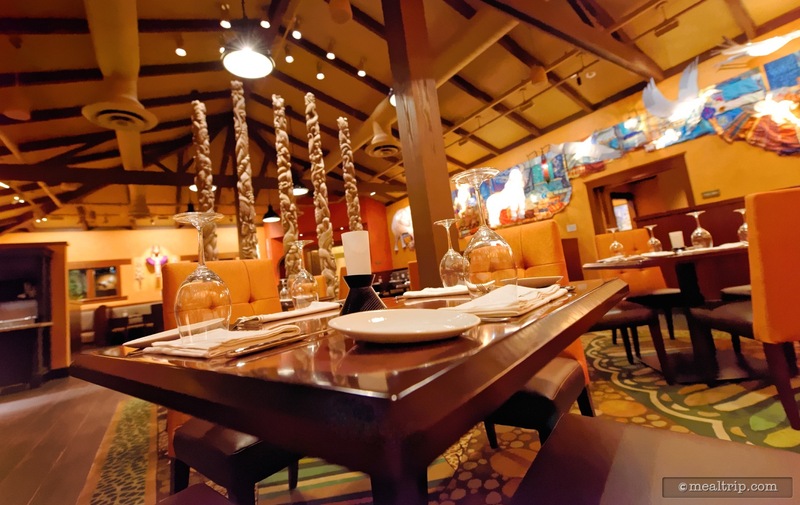 The "Grand Gallery" dining area at Tiffins had been part of Pizzafari's dining area. 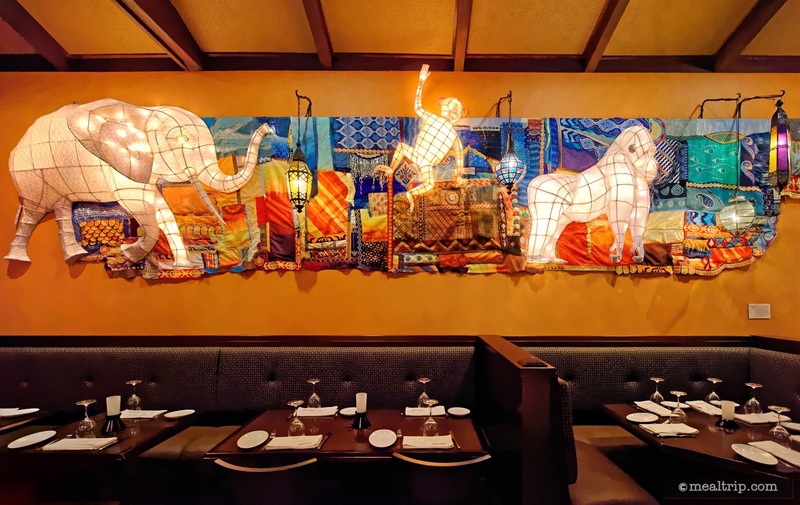 Some of the new art pieces in the Grand Gallery at Tiffins are these animal shaped "paper lanterns". 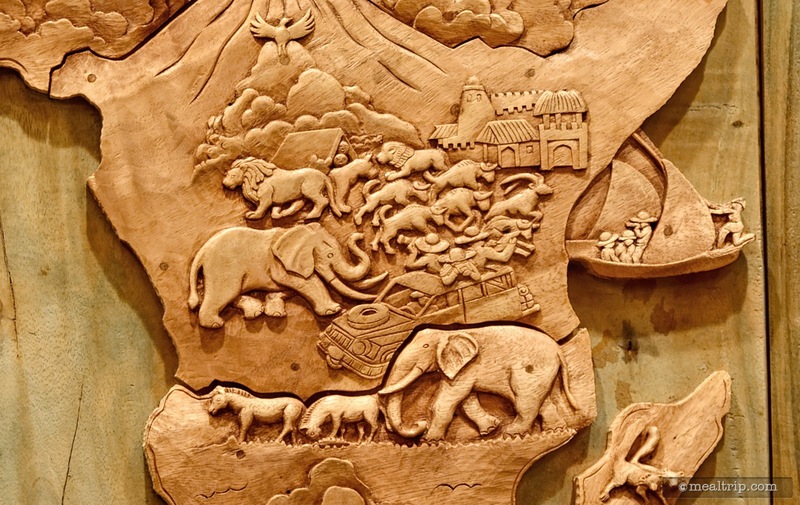 This style of art is also used in the Rivers of Light show at Animal Kingdom. Some new ocean elements have been added to the wall art collection. 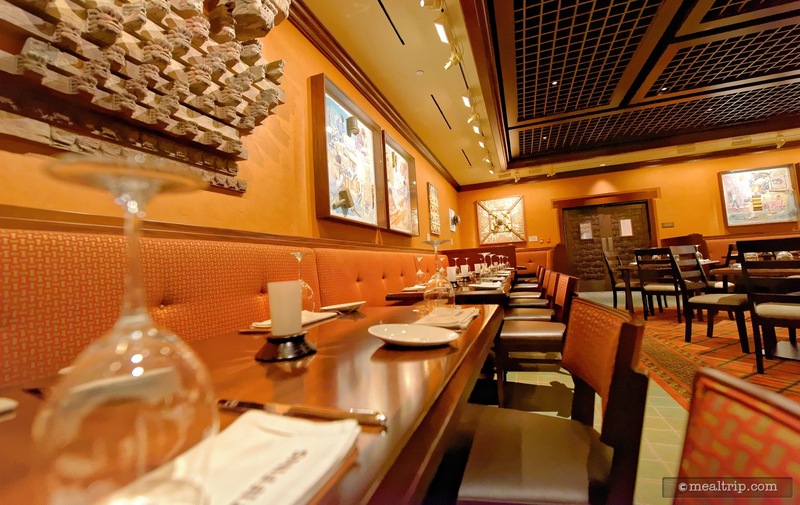 Here some more of those communal booth seats that I'm not super fond of at such high-end dining locations. 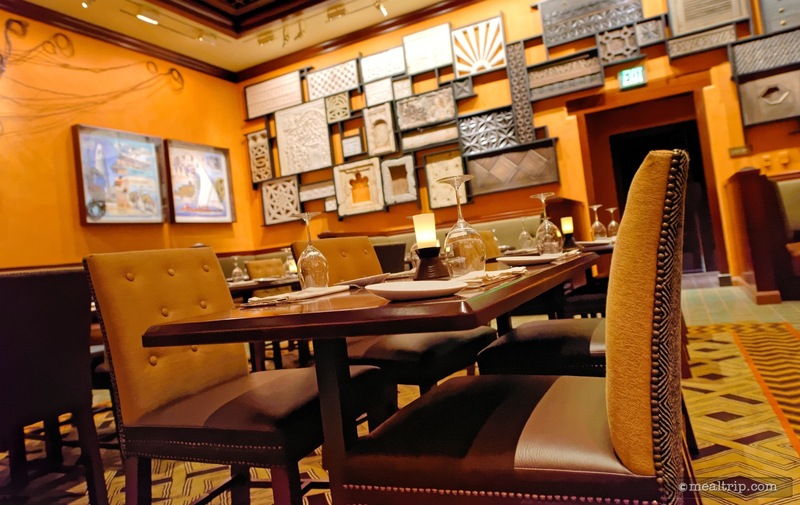 A table in the Grand Gallery Dining Room at Tiffins is ready for you! Most seats in the Grand Gallery offer a unique view of something, and the stand-alone tables are spaced fairly well apart from one another. 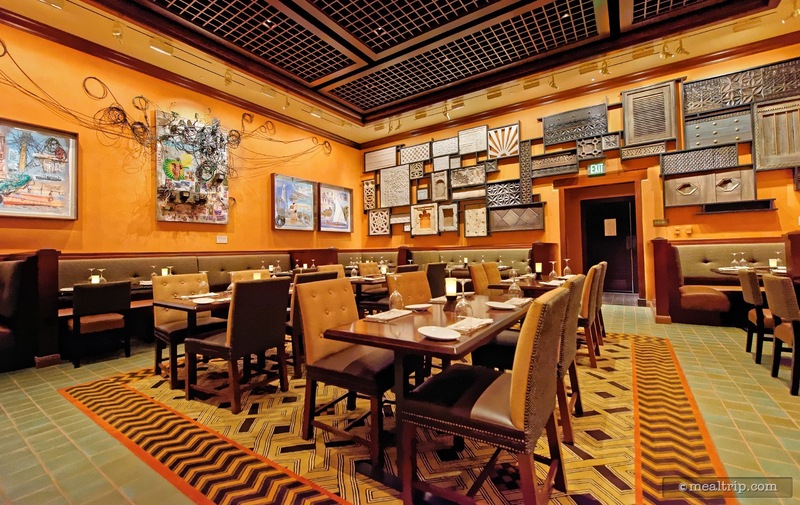 Most of the tables in the Grand Gallery at Tiffins offer great views of all the artwork, and are spaced far enough away from one another so that you don't feel too crammed into the table next to you. 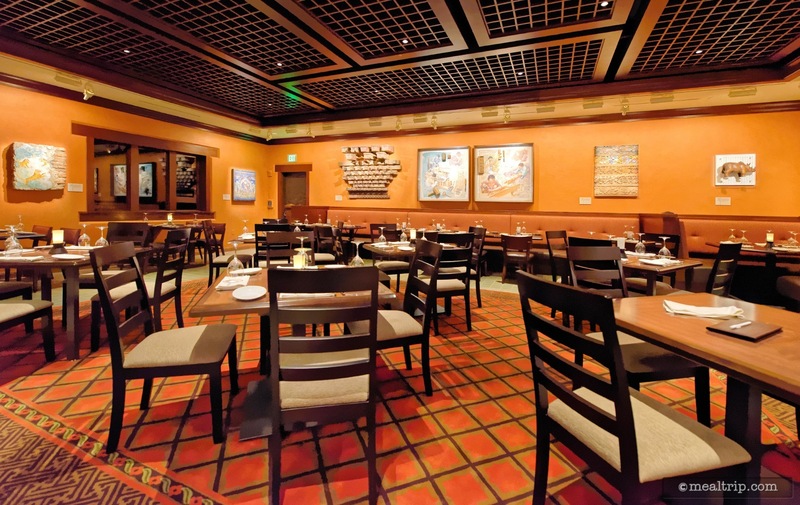 The Grand Gallery dining area at Tiffins is the largest of the three seating areas. 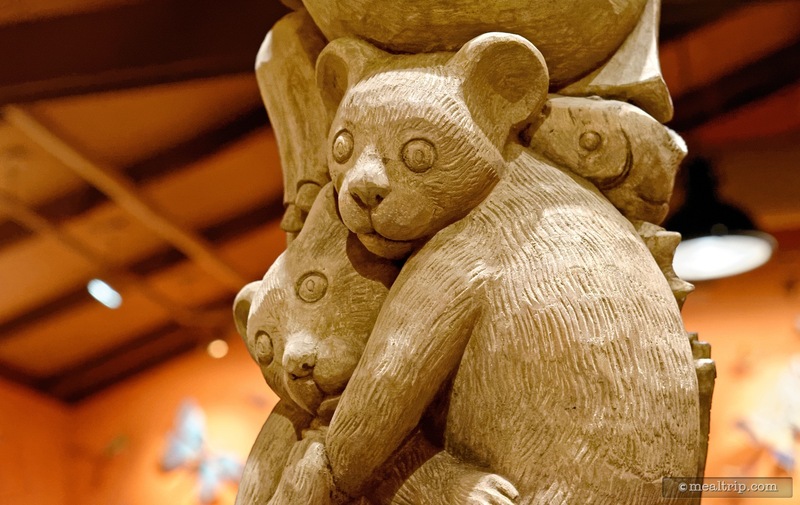 The centerpiece in the Grand Gallery are these totem-pole type carvings that have been... repurposed... from the now closed Camp Minnie-Mickey area. 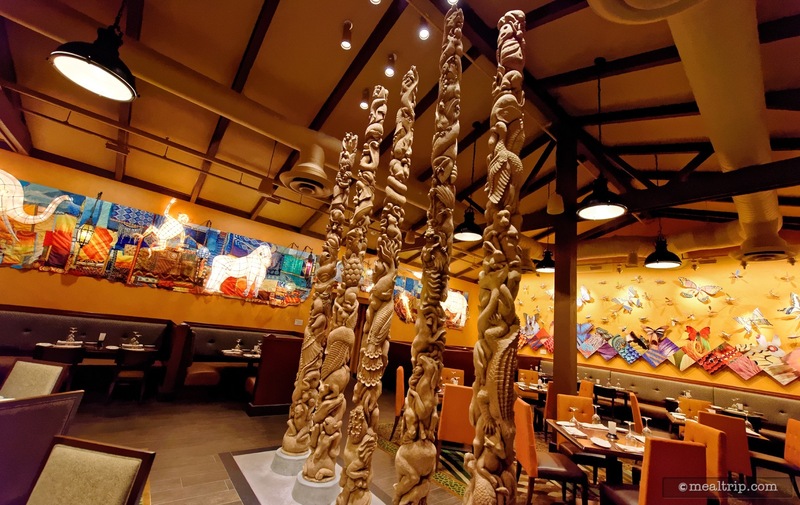 Five totem-pole carvings have been rescued from their previous location next to some brightly colored plastic kid chairs in the old (now closed) Camp Mini-Mickey. They do look much better in here, than they did out there. 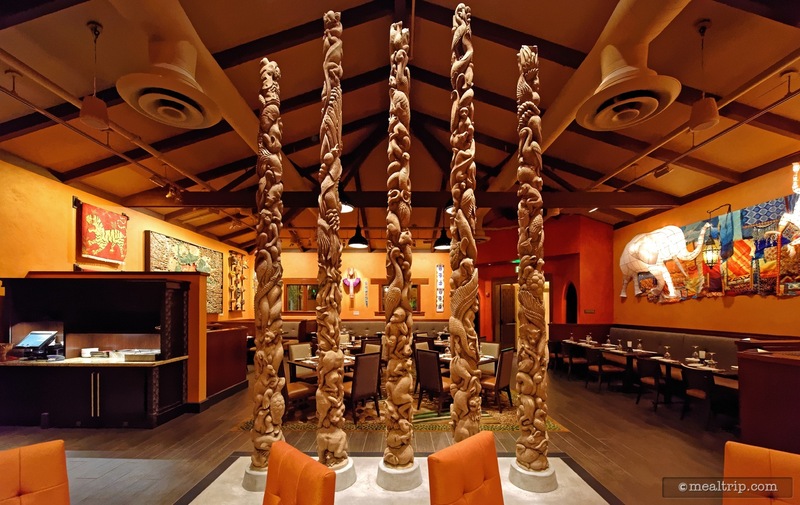 The animal totem poles are a very cool centerpiece element in the Grand Gallery Dining Room at Tiffins. 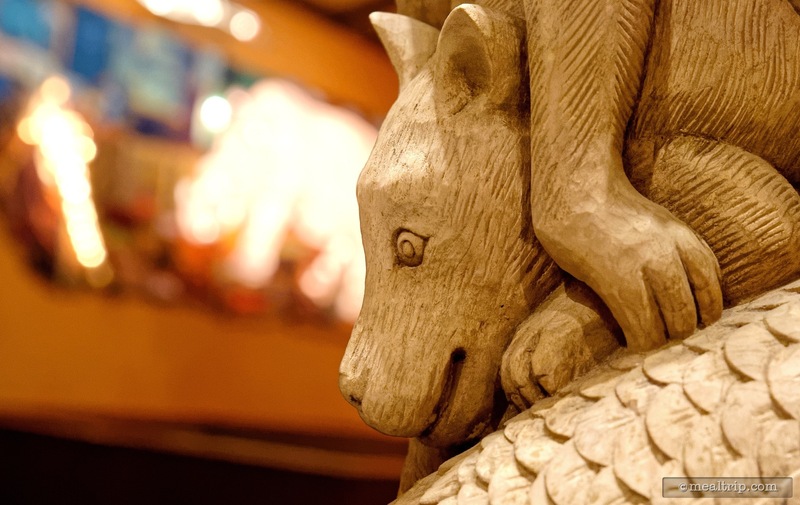 There are many animals on the five unique pillars located in the center of the Grand Gallery dining area at Tiffins. Awe don't be scared little guys... I'm gonna eat you! Wait... what??? 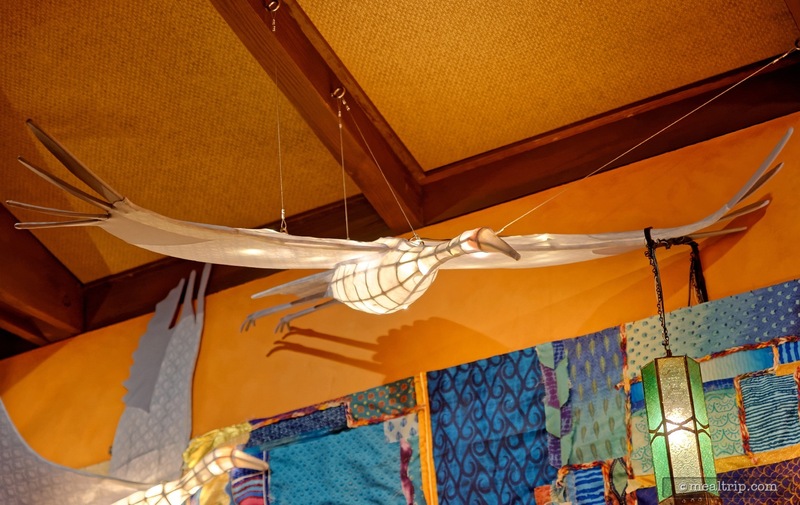 Foodies eat things, there's no getting around that one, but the irony of dining in a room dedicated to the animal species that the Disney Conservation Fund serves to protect, is not lost on me... and just a little odd... concept-wise. Hey look, it's Baby Caesar from Planet of the Apes! Well, probably not... but the Poles-of-Life sure are fun to look at. 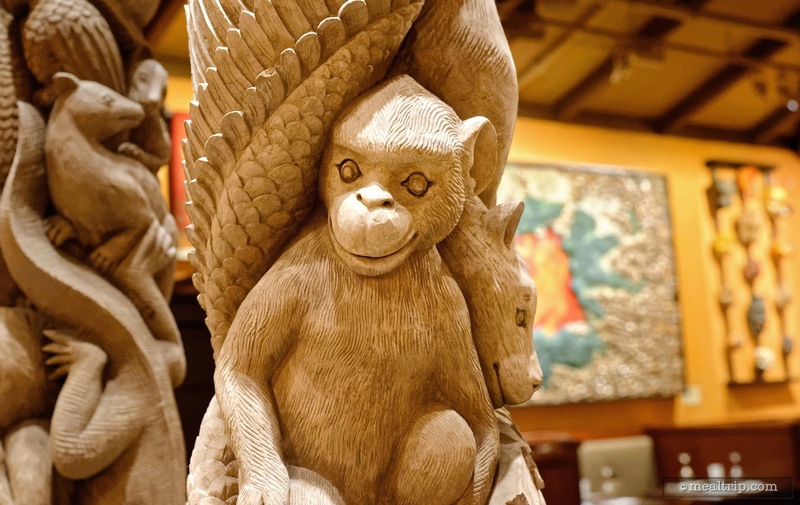 There's no bad place to sit when looking at the wooden Balinese inspired centerpiece in the Grand Gallery Dining Room at Tiffins. 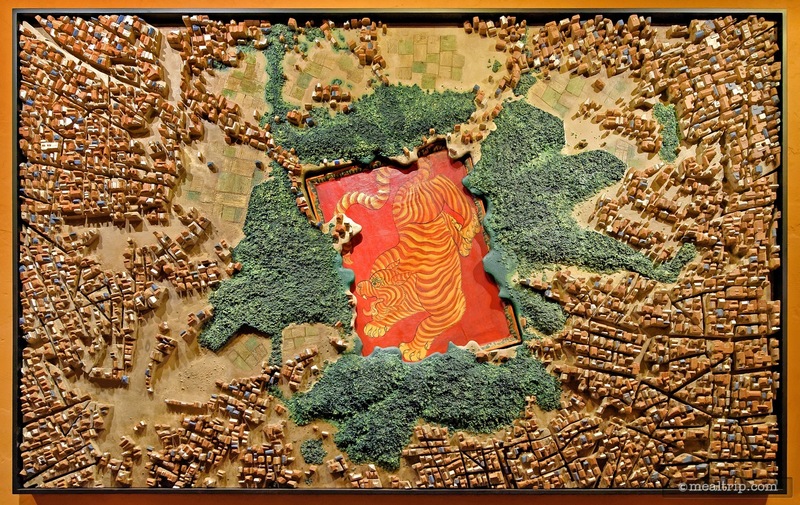 Personally, I think this overhead relief map of an African township is one of the cooler pieces in the Grand Gallery. These two pieces aren't anywhere close to one another... I really like the carving on the left though. It's five different styles of the same pattern. Very cool. 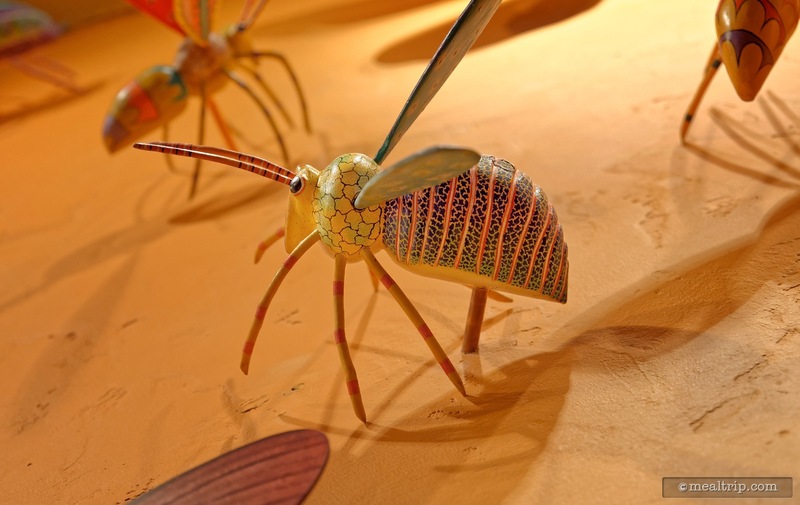 Waiter, there's a bug in my soup. Well... on the wall anyway. These guys are so big, they would make for a great entree! 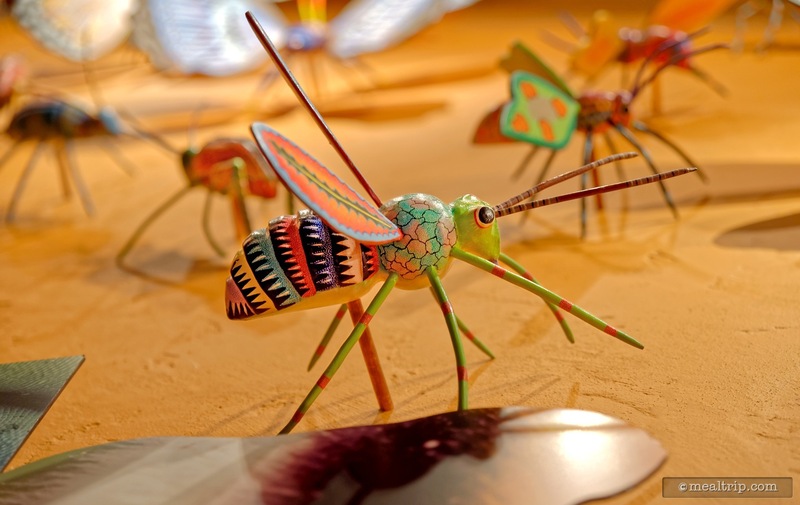 The Bugs-on-a-Wall piece in the Grand Gallery at Tiffins is actually quite detailed and expansive, when you realize that no two bugs were hand-painted alike. 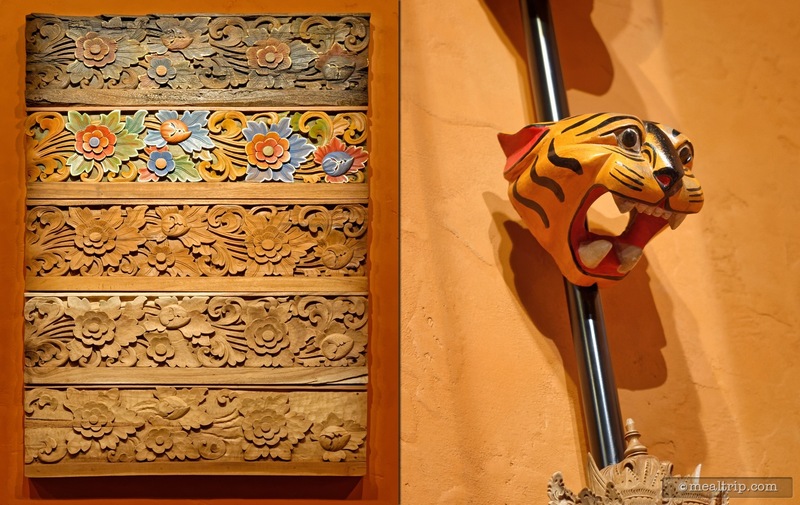 Along the south-west wall of the Grand Gallery room at Tiffins are paper lantern style animals. 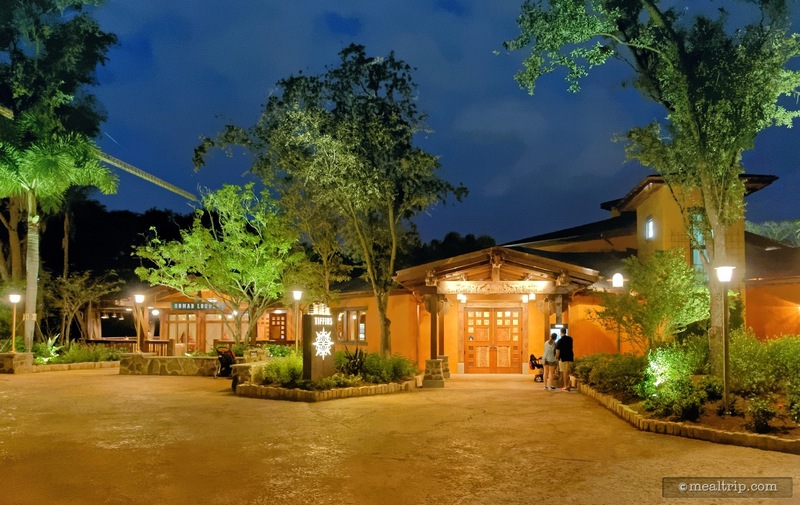 A similar style is used in the new Rivers of Light show. 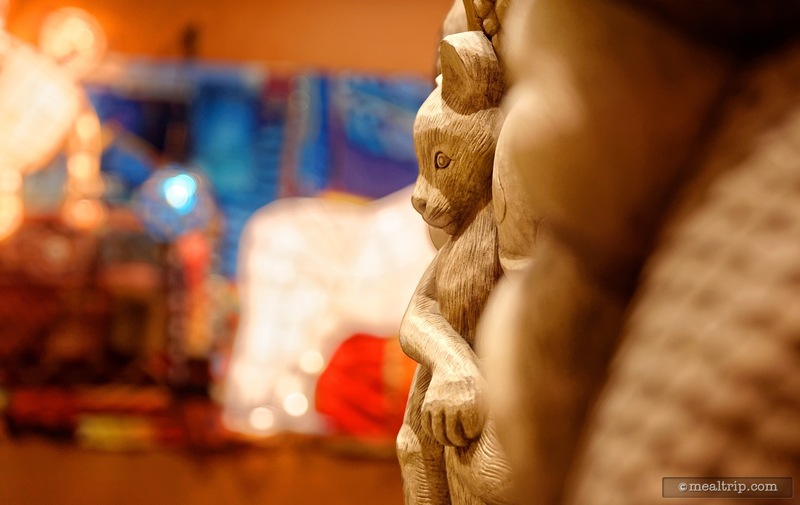 This colorful gorilla is located in the Grand Gallery room at Tiffins. 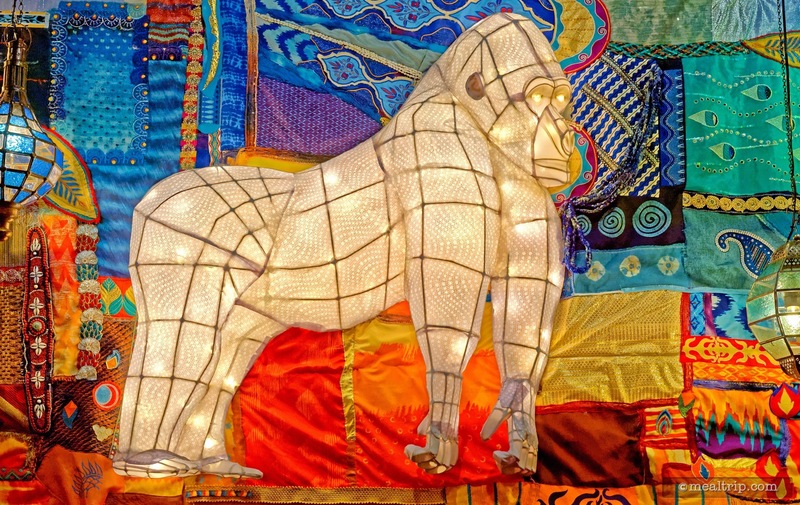 This inner lit paper lantern style of art is used in the new Rivers of Light show in the evening at Animal Kingdom. 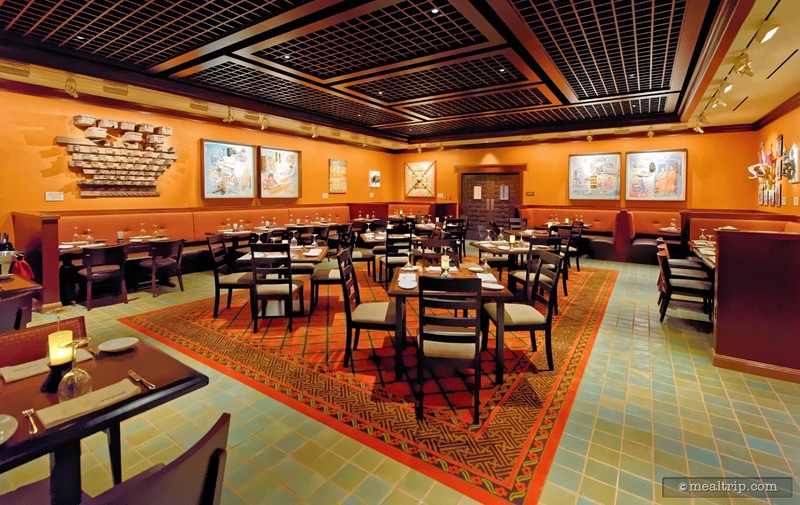 Here's a another view of the Grand Gallery dining room at Tiffins. Here, I'm facing west. 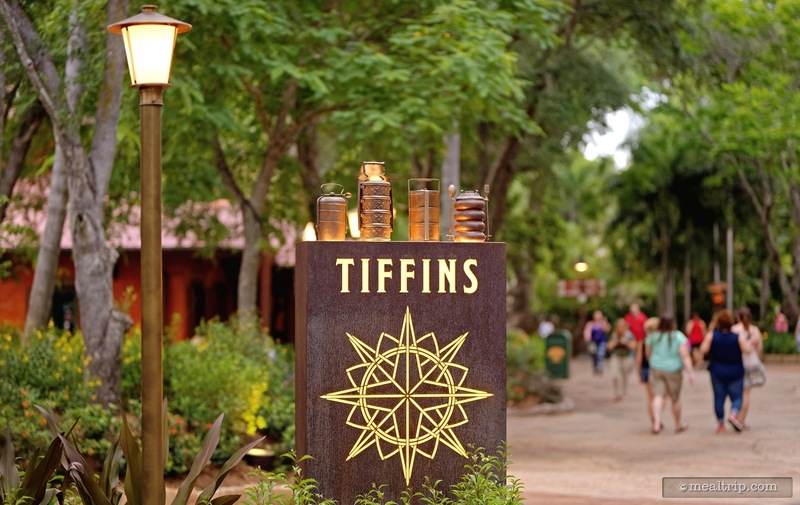 Standing in the entrance to the Normal Lounge and looking back at the Tiffins exterior sign. Standing in the main Discovery Island walkway looking down Tiffins Lane (okay, I just made that last one up).